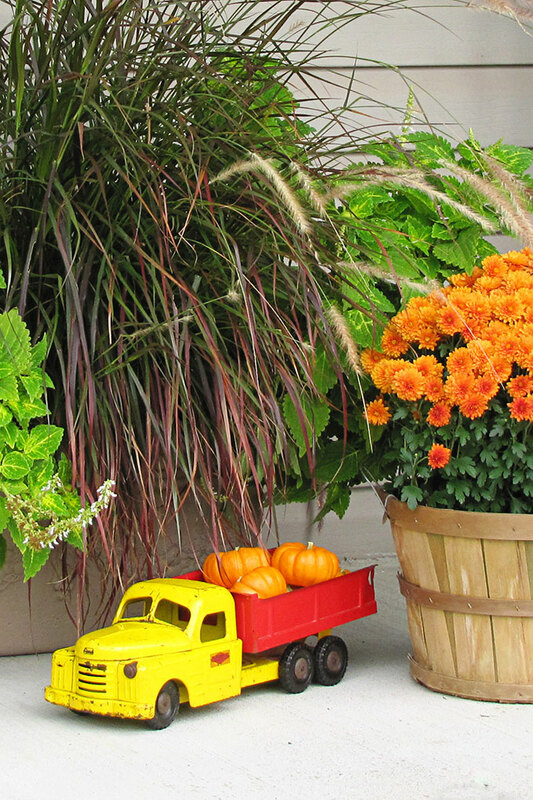 Fall porch decor tips, tricks and inspiration. Your porch is the first impression people get of your home, so make it a festive one! You guys, it’s here!!! The officially unofficial first day of fall. Sure, some people wait until after Labor Day to start in with the pumpkins and cornstalks. Or wait until the Equinox to start jumping around in leaf piles (Gasp . . . who can wait that LONG). But no, I herald fall’s colorful arrival on September 1st!!! I am giddy with autumnal excitement! I have NO IDEA what I’m doing on the porch this year. N. O. N. E. But I do have a few tips for you . . . Traditional is good. 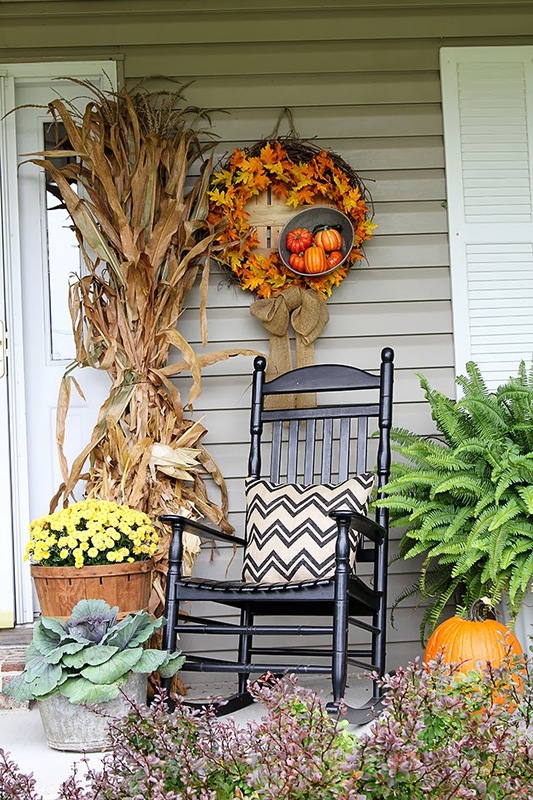 You can’t go wrong with a hay bales, pumpkins and a festive wreath for your front porch fall decor. The old standbys shout FALL to anyone walking by. Unexpected is good. 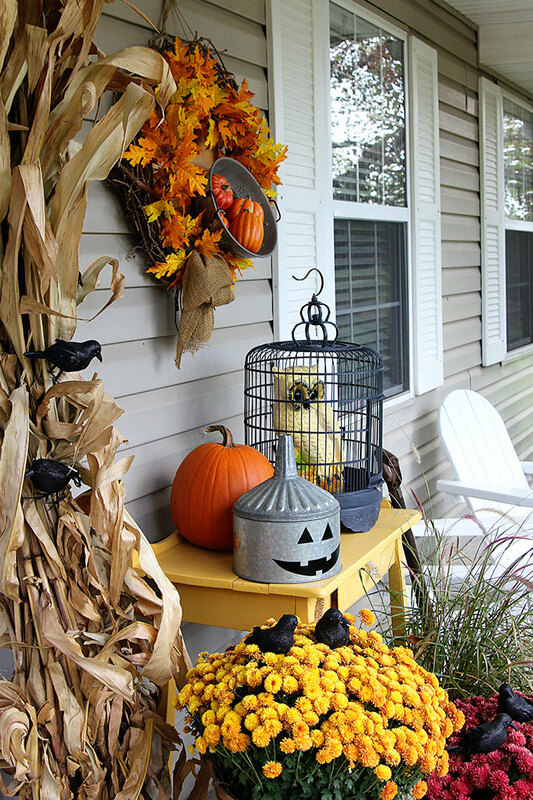 As you can tell from my previous fall porch posts, I enjoy a bit of whimsy. Trucks hauling baby pumpkins, a wreath made from a picture frame and a thrift store “tacky’ ceramic owl all bring an unexpected flair to a fall porch. Or as the neighbors call it – a bit of nuttiness. Size does not matter. Contrary to popular belief, no matter the size of your porch, you can still do something pretty cool with it. I’ve seen some pretty festive porches that are basically just two steps and a door. Cornstalks are a must. They really are a show stopper. 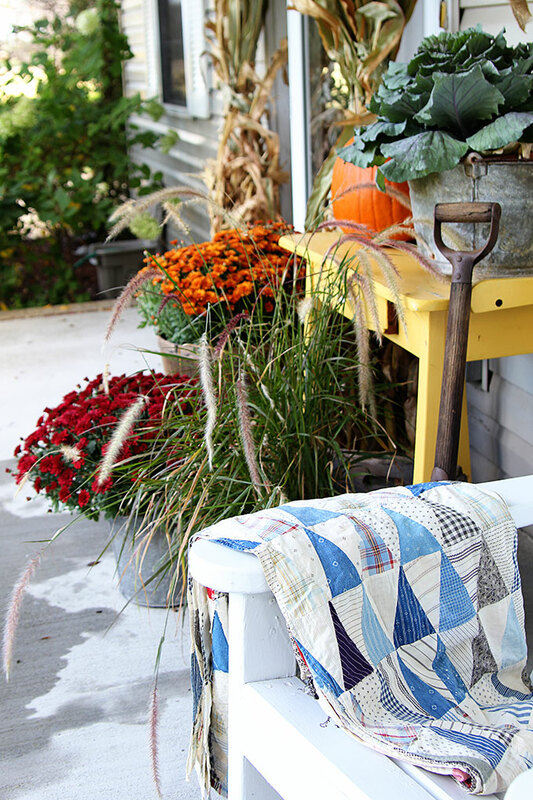 Tie a cornstalk to a porch pillar or railing and it’s instant fall gratification. Orange isn’t a requirement. Don’t like the oranges and rusts for fall? Fall can be achieved with creams, whites and greens also. There’s a pumpkin out there for everyone’s decorating style nowadays. Candy corn is good. Eating a bag of candy corn while decorating your porch makes it all the more enjoyable. Swimsuit season is gone – I say go for the big bag! To get YOU further in the mood, I dug around my fall archives and put together some fall porch ideas for your viewing pleasure. Sit back poolside, grab a margarita and dream of the cooler weather coming our way! Any fall decorating plans for the weekend? Or are you planning on squeezing out the very last drop of summer before it’s “officially” out of here? UPDATE on my Country Living Fair tickets giveaway – the winner is Rachel P. Congratulations Rachel, I hope you enjoy the tickets and find lots of treasures!!! Just a reminder though, I get first dibs on all thermoses at the fair! I LOVE all of your fall decorating ideas, Pam…I’m excited about fall decorating, too! 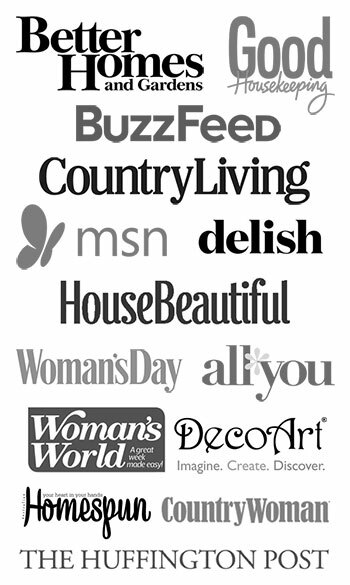 A BIG congrats on the Country Woman feature…the owl was one of my favorites! Great decor ideas Pam. It was so nice to turn off the air conditioner and throw open the windows last night. Today in the low 70’s. Loving it. that ceramic owl is so stinking cute…..I live back in the Phoenix area….so fall really doesn’t hit us till maybe mid December….LOL….then we have a week of winter in mid January….so it’s different….but we still have fall decorations….I will start putting some out mid month…..
That’s really got to be hard to get in the mood, but then again you don’t have to deal with ice and snow either so that makes up for any lack of fall color! I’ve never been to Arizona, but the photos I see from there are GORGEOUS! Isn’t that weird! It’s sort of odd to see yourself someplace else online or in a magazine. I don’t think I’ll ever take it for granted. But now you’re making me nervous about my porch this year – I need to step it up!!! Congrats on yet another great achievement!!! Thank you Dee!!! And you can steal my ideas anytime! Love your ideas too Pam! Pinning. I’m trying to come up with something this year. Congrats on being in the magazine!!!!!!!! Thanks Florence! 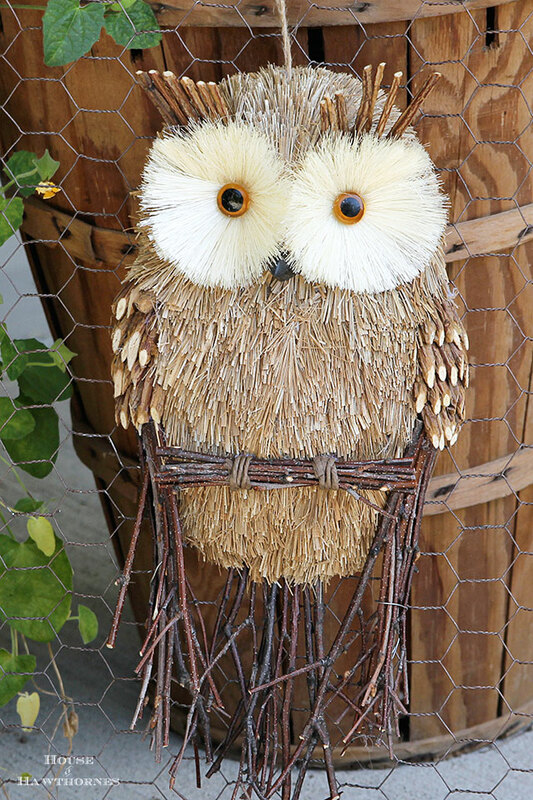 I bet with all the neat stuff you find at the sales you can come up with something fun for your porch! 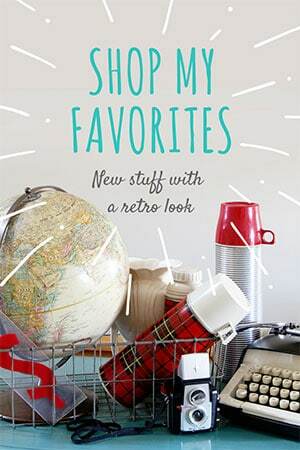 Are you going to any sales this weekend or is the holiday weekend messing up your plans? Going to at least one tomorrow I think, but have so much stuff already, don’t “need” to buy anything else! Who said anything about “need” LOL. I’m thinking about decorating for fall, but I’m hanging out in summer mode as long as possible! I like your examples of your fall porch decorating, though. I especially like that little Tin Man funnel-hatted guy. Very cute! That clay pumpkin you show once graced my porch for Halloween. LOVE it. Think mine cracked, then broke. LOVE all the looks you showed. I have had my autumn wreath on the door for a few weeks now. As usual I loved this newsletter. Porch decorating…well any fall decorating I’m ready for. Sept 1st is a great day. Love Halloween too. Eating candy corn a MUST. Bought a bag this week. Sorry I can’t make it to the Country Living Fair this year. Have so enjoyed it the last two years. Thanks for introducing me to it. Have a great weekend decorating and shopping. Oh, no. Well, mark it on your calendar for next year. My favorite season, I love the cooler weather, the blaze of colors on the trees, boots and flannels and everything the season brings. I start right after Labor Day. I don’t want to miss a day of the Autumn colors as this is one of the shortest seasons when it comes to foliage. Pam, all your décor is just so festive. The pumpkin oil can is so cute!!! I like the owl as well, back in the 70’s when I grew up they were so ugh but now they made a trend and look adorable, both of the ones you showed are really different. I have a wood bird cage and every Fall I put a huge skeleton head in it I never thought to find an owl or even a crow. But like you as soon as I step into the stores and see the Halloween candy and caramel apples I am loading up. Congratulations on making the magazine!